The upcoming Nobunaga&#39;s Ambition isn&#39;t set in 16th century Japan, but the modern day. The upcoming Nobunaga's Ambition isn't set in 16th century Japan, but the modern day. 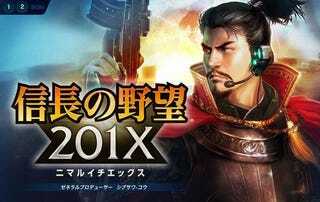 Dubbed Nobunaga's Ambition 201X, this RPG features a machine-gun-toting Nobunaga. The game is slated for iOS, Android, and PC (no word about a Western release). Let's hope they do a version with Pokemon... and guns?